Trinity-ThinkPad. Lenovo expands the Thinkpad Edge series with another model that has AMD parts on the inside. Within the case of the Thinkpad Edge E535 is an APU from AMD's current Trinity-Generation. We test if the device is any good. 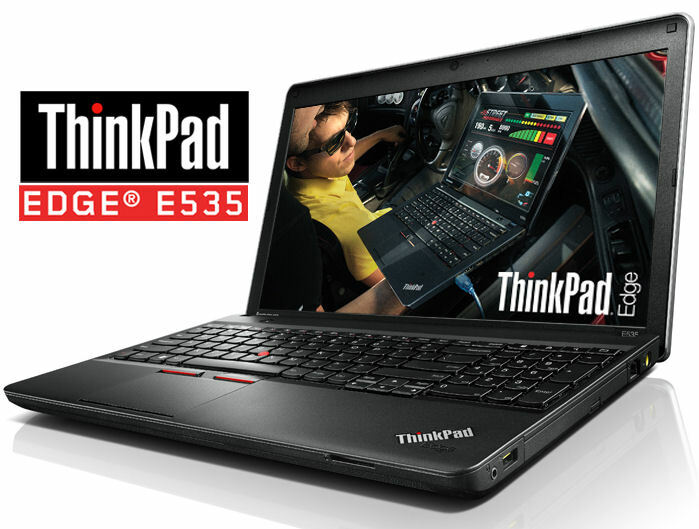 Lenovo introduced the Thinkpad Edge E535 as the successor to the E525. Both devices are based on AMD's Fusion-platform. The E535 comes with an APU based on the new Trinity Architecture, while the older E525 was based on Llano architecture. The Edge E535 is available with different component configurations. Our test model is powered by an AMD A8-4500M-APU (quad core CPU, Radeon HD 7640G). The APU comes with 4 GB of memory and a 750 GB hard drive on the side. There is also a DVD-burner onboard. The competition is mainly found in the same family. The already mentioned predecessor Thinkpad Edge E525 (AMD A8-3500M) is a good example of the competition. The Thinkpad Edge E530 would also have to join the group as the Intel-counterpart to the Edge E535. A comparison with the Thinkpad Edge 530 that we already tested wouldn't be fair, because it has a middle-class dedicated graphics card (Nvidia GeForce GT 630M). The competition of the Thinkpad Edge 535 would have to be the Thinkpad Edge 530-variant, which only has integrated graphics. The case is made completely of matte-black plastic and the screen is surrounded by a silver plastic frame. The overall stability of the case is acceptable. The hand rests for typing hold secure with pressure. The keyboard only gives in a little. 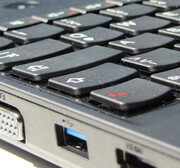 In the number block area of the keyboard, which is positioned over the optical drive, there is a bit more strength. The stiffness could be better. If you were to take the open notebook and hold it by two opposite corners, it would turn slightly. The build quality is also not 100% well made. When you close the top of the netbook it doesn't sit flush with the bottom side. At this point one would have the impression that one of the internal hooks was missing or broken. Interestingly, the almost identical Thinkpad E530 left a far better feeling at this stage. 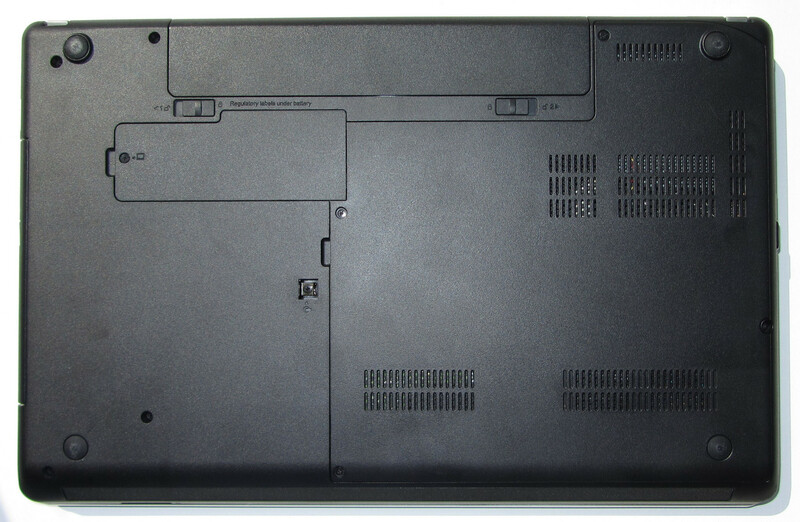 The reverse side of the lid is equipped with a layer of rubber (soft-touch surface), just like the other Thinkpad Edge models. Our test model sports a black ('Midnight Black') rubber layer. The Thinkpad Edge is also available in red ('Heatwave Red') and blue ('Arctic Blue'). The lid makes a decent impression, despite the fact you are able to twist it. The metal-finish lid hinges hold the display firmly in position with minimal movement. 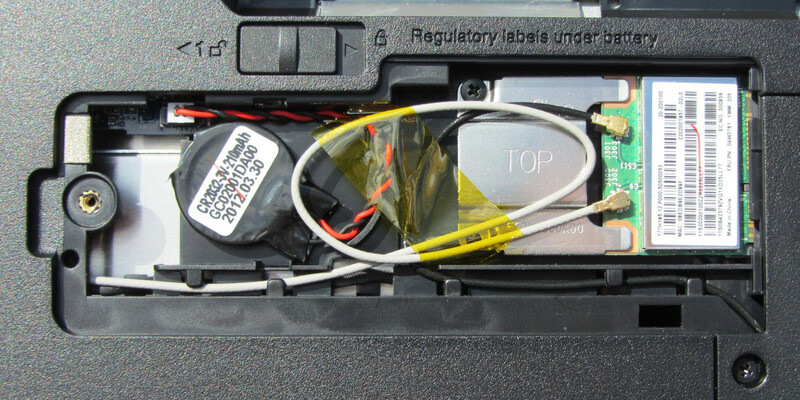 One problem we had with the Thinkpad Edge E525 was the loosely secured optical drive, and we find the same problem with the E535. The E535 has also seemed to have inherited the rattling battery. 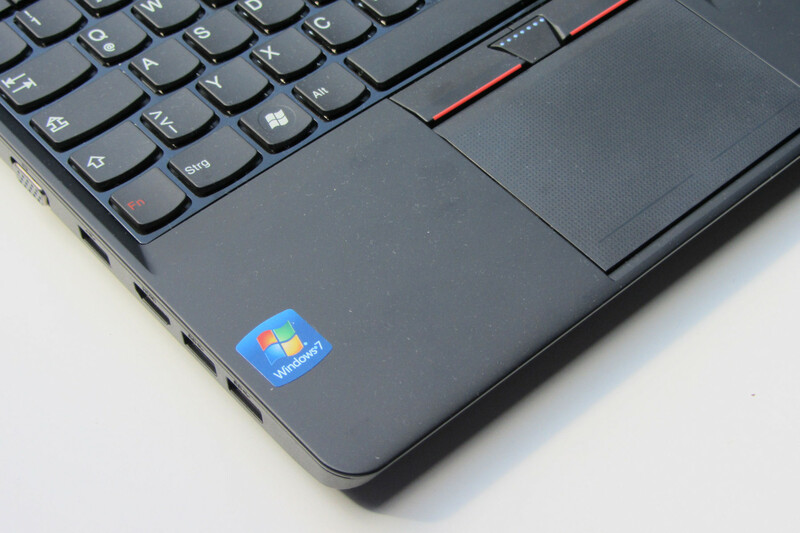 In terms of connectivity Lenovo has changed a considerable amount from the Thinkpad Edge E525. On the left side of the device there are three USB 3.0 ports. The Thinkpad Edge E525 only uses USB 2.0 ports. You will also find VGA-output and an HDMI port. The eSATA/USB combo port from the E525 has not been used again. This is fine due to the USB 3.0 Ports. Optimally Lenovo could have turned one of the three USB 3.0 ports into a combined eSATA/USB 3.0 port. The right side of the device sports a Gigabit-Ethernet plug and a fourth USB port, although this one is a standard 2.0. 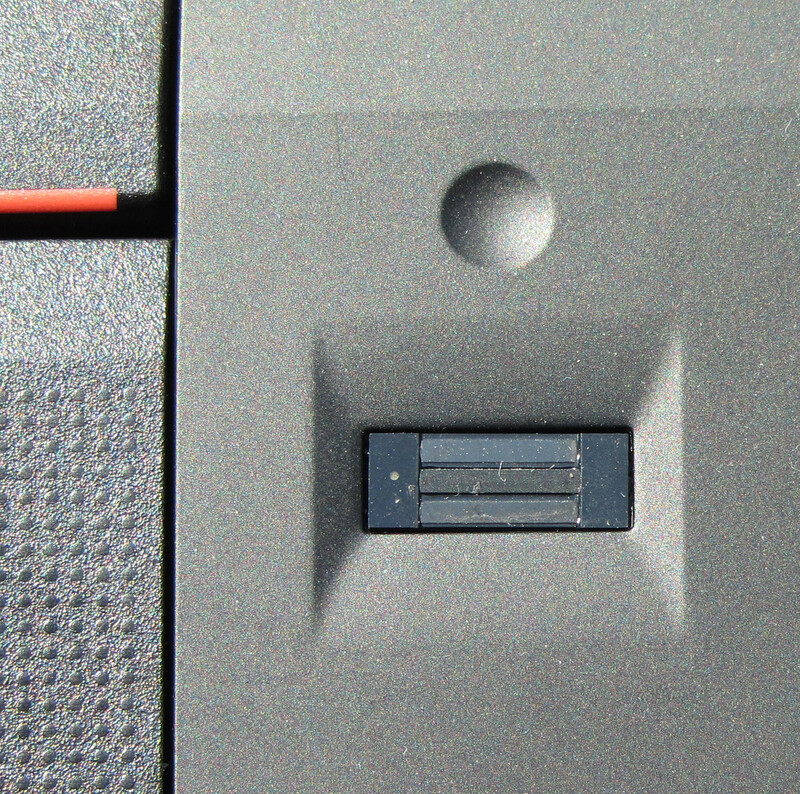 The optical drive and an audio-combo socket have also found their places on the right hand side. 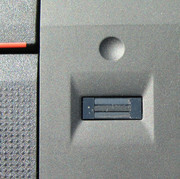 The Express Card slot of the Thinkpad Edge E525 has been done away with for the Thinkpad Edge E535. This is a shame as now the possibility of certain expansions has gone. 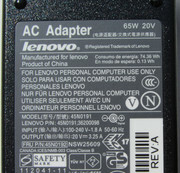 A memory-card reader is found at the front of the notebook, which works with the usual types (SD, MMC, MS, MS Pro, xD). Right side: Audio combo, 1x USB 2.0, Gigabit-Ethernet, power plug and the DVD-Burner. The back is free from any ports. The memory card reader is the only thing on the front. Our test model comes with all the expected features of a communications device. There is a WLAN-module from the company Broadcom onboard the notebook which uses the standard 802.11 b/g/n. The module from Broadcom also includes a Bluetooth chip. For wired network connections the device uses a Gigabit-Ethernet chip. 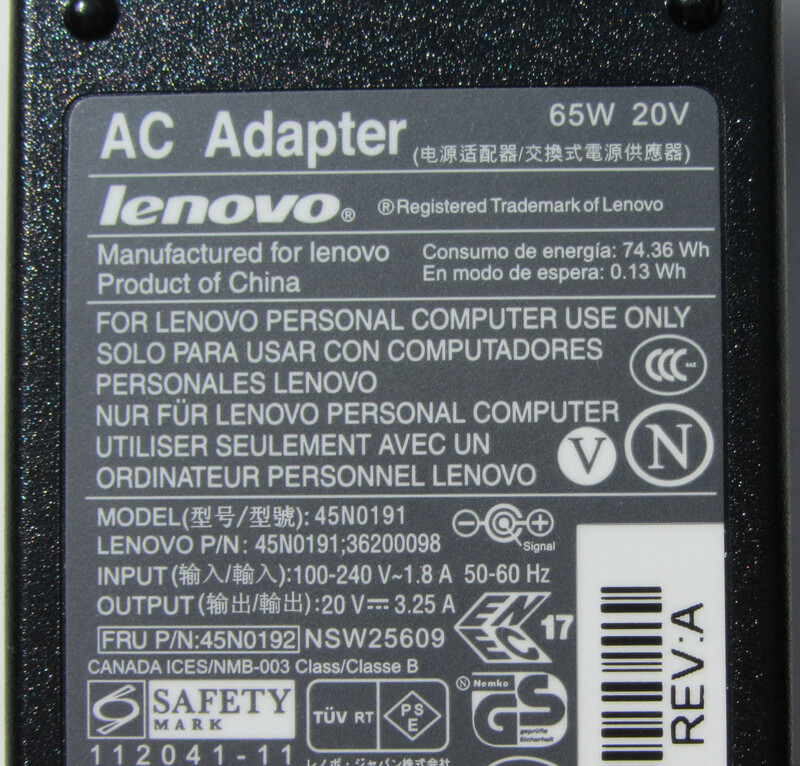 Lenovo uses a chip from the well-known Realtek RTL8168/8111 family. Lenovo has also given a webcam to the notebook. This is located on the screen frame, surrounded by two microphones. The range of security features is quite weak for a business-notebook. Lenovo offers this device with a fingerprint reader, but not every variant of the device will come with one. The fingerprint reader can be utilized via the already installed software Authentic TrueSuite. 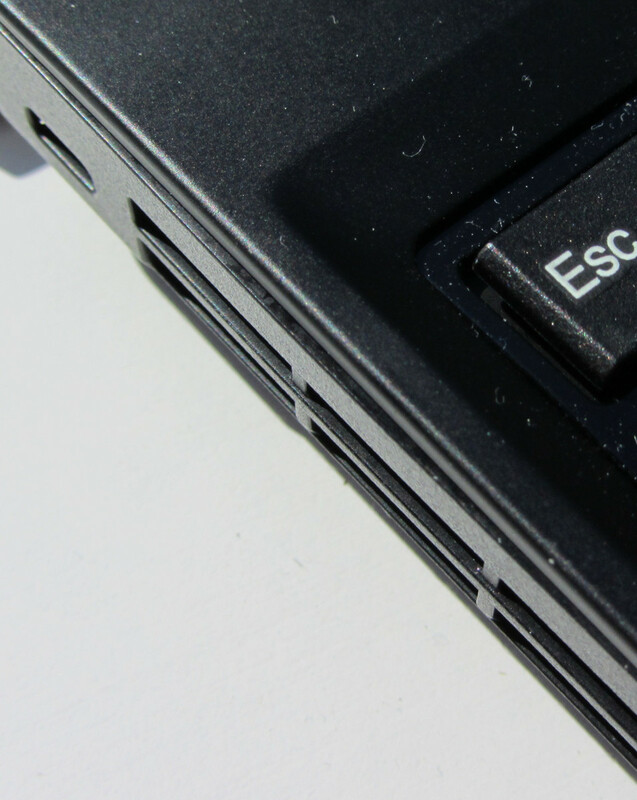 This makes it possible to secure not only access to Windows with a fingerprint lock, but also access to internet services. The obligatory port for a Kensington-lock is also present, but otherwise that's all in terms of security. Neither the Thinkpad Edge E535 nor the Thinkpad Edge E525 offer TPM or a Smartcard reader. The section on accessories is over and done with quite quickly. Apart from the power supply and a battery, the only thing you'll find in the box is a poster with a quick-start guide and guarantee information. The device comes with an already installed 'Windows 7 - Home Premium' operating system. There is no Windows 7 DVD with the product, as reinstalling the system is done with help from a Recovery-Partition. The amount of additional software is manageable. Aside from many Lenovo-tools, the Google Chrome browser and Authentec TruSuite, the other pre-installed programs include Corel WinDVD SE, Corel Burn.Now and DVD MovieFactory. This begs the question, why are there these kinds of programs already loaded onto a business notebook? What's more is that Windows already has functions itself to do the tasks that these other three programs do. Furthermore, a 30 day test version of Norton Internet Security has found its way onto the hard drive. Also Microsoft Office 2010 Starter and the Windows Live Essentials are already installed. An alternative UI is offered by Lenovo through its Simple Tap feature. This is highly reminiscent of the look of a tablet-PC. Whether or not this feature should really be on a business notebook is also questionable. SimpleTap turns out to not only be quite useless, but also very annoying. 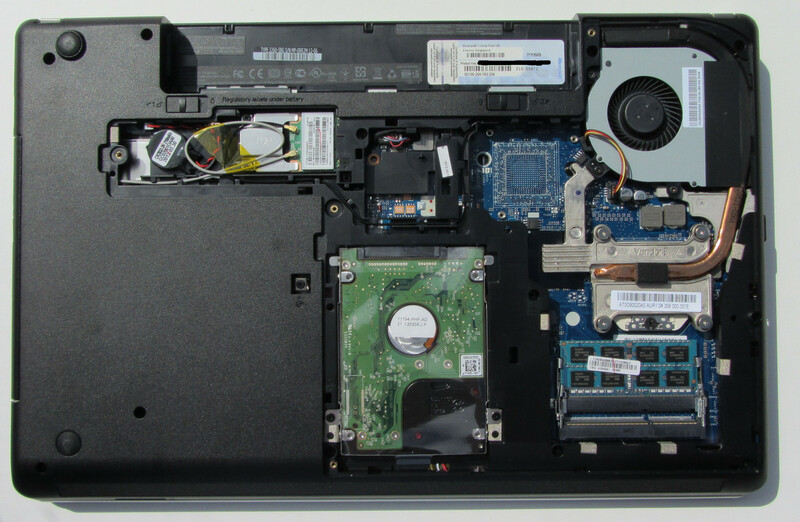 The Thinkpad Edge E535 offers great and comfortable maintenance possibilities. Compared to the Thinkpad Edge E525 there is noticeable improvement. On the underside are two compartments. Through the smallest door you will find the BIOS battery and the WLAN module. Under the larger door is where the RAM, hard drive, CPU and cooling system are all hiding. The notebook has two slots for RAM, and one is unused. This means a very simple and cheap upgrade to 8 GB would be possible. The Thinkpad Edge E535 supports up to 16 GB of RAM. The hard drive can be quickly removed and replaced with another model. Also the optical drive is swappable. All you need to do for this is undo the screw and then pull the optical drive out of its slot. The big improvement over the Thinkpad Edge 525 is that it provides full access to the cooling system. The user can remove the fan for easy cleaning. You could even take the APU out and replace it with another model. We have to praise Lenovo here. Lenovo equips the device with a 12 month Bring-In Warranty. 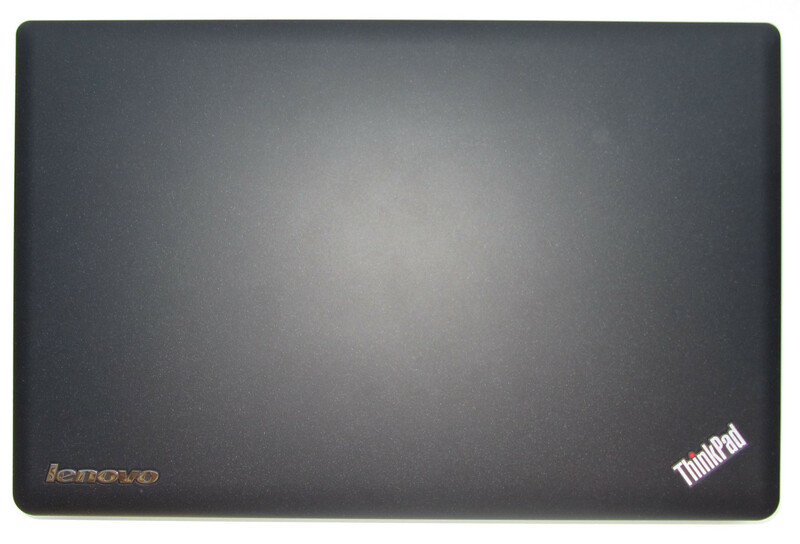 The customer sends the notebook directly to Lenovo in the case of a defect. This time frame is customary nowadays. However, when it comes to a business device you would expect a warranty of at least 24 months. Lenovo offers the possibility to extend the warranty to 2 or 3 years, the cost of which is about 50 Euros and 70-90 Euros respectively. A three year on-site warranty would set you back 120 Euros. 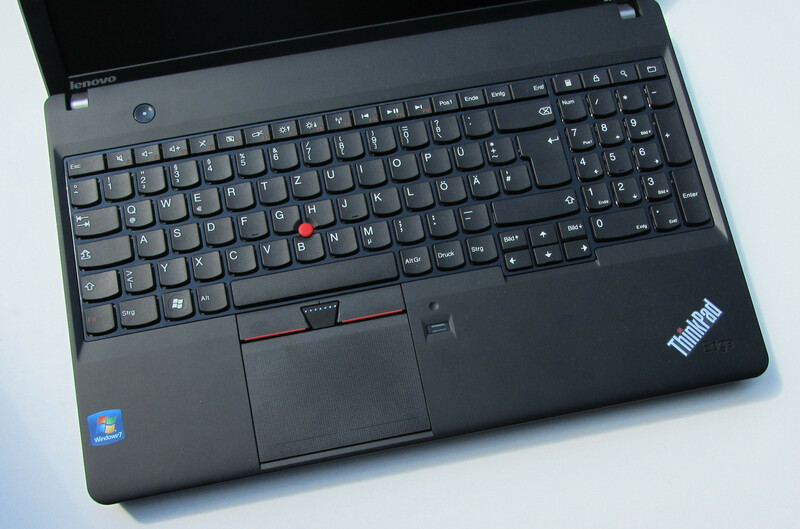 Lenovo provides a Clickpad with the measurements of 9.2 cm x 6.5 cm on the Thinkpad Edge 535. A Clickpad is a Touchpad without separate mouse buttons, with the whole Clickpad being essentially one big key. If you are to click on the bottom of the Clickpad, it will interpret the click (based on your finger position) as either a left or right mouse click. 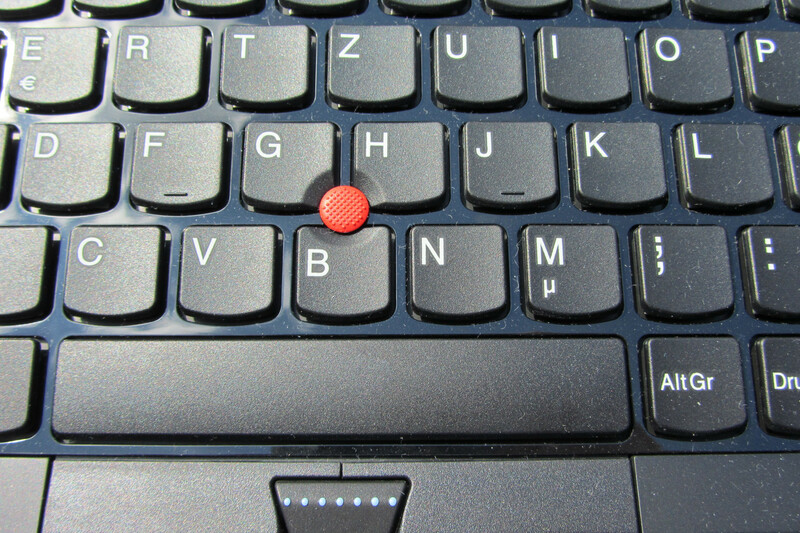 The surface of the Clickpad is covered in tiny bumps, but your finger can glide easily over it despite the roughness. The touch pad is also enabled for multi-touch gestures, such as the two finger zoom. The Clickpad features a firm and easy to identify point of pressure. 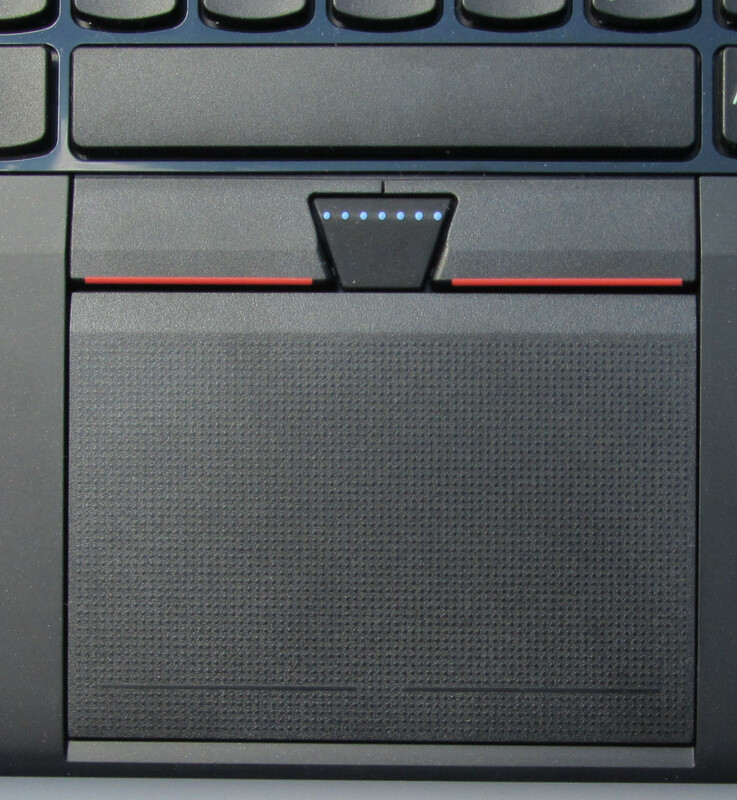 As an alternative to the touch pad, the Thinkpad Edge 535 offers a Trackpoint to control the mouse pointer. This allows for fast and precise movement of the pointer. 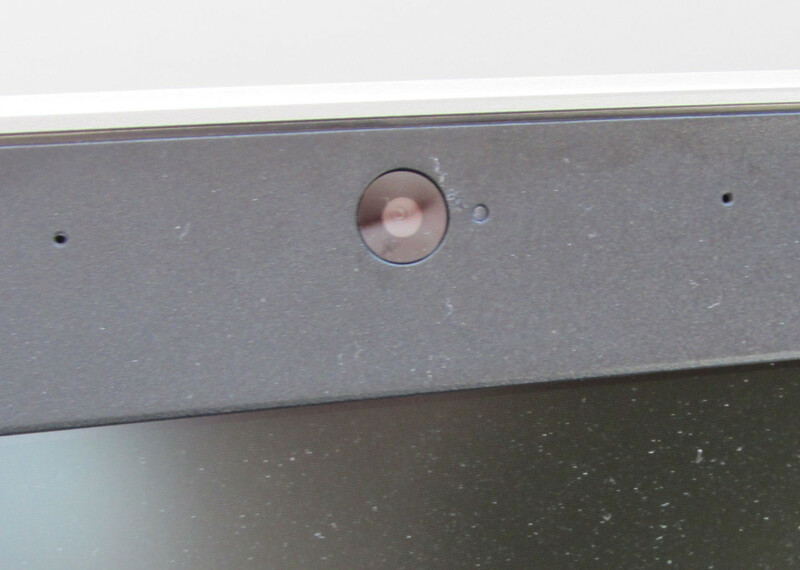 The corresponding mouse buttons are located directly above the touch pad. The keyboard does not have a backlight. There is also a Trackstick included. Our test model is armed with a 15.6-inch matte display. The resolution of these LED-lit displays is 1366x768 pixels. In regards to brightness, the Thinkpad Edge 535 has had a strong improvement since the Thinkpad Edge 525. With an average of 259 cd/m² (Thinkpad Edge 525: 210.3 cd/m²) the display has a sufficient brightness level. The brightness distribution has also had a clear improvement, now up to 89% (Thinkpad Edge 525: 67%). According to the Lenovo website, the Thinkpad Edge 535 is also available with other displays; so there should be displays with glazed surfaces and/or higher resolutions (1600x1900 pixels). At the time of this test we were not able to find any alternative models with other display setups. 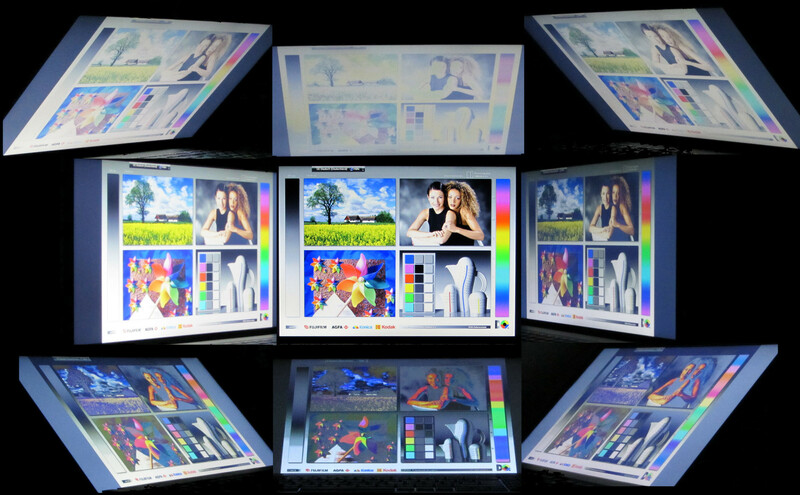 Normally a display with 1600x1900 pixels would be very interesting for a business notebook. We've already had this same panel on our Intel-variant Thnkpad E530 test. The improvement on brightness and illumination since the Thinkpad Edge 525 display has made Lenovo produce almost catastrophic results in the tests of black level and contrast. The Thinkpad Edge 525 was sitting on an already poor black level score of 1.59 cd/m². With the Thinkpad Edge 535 Lenovo now has a score of 2.24 cd/m², making it look like they are having a laugh. The corresponding low carries on to the contrast with a score of 123.1 (Thinkpad Edge 525: 142:1). Black contents in pictures disintegrate in to a gray mush on the display, and generally the whole picture looks pale. 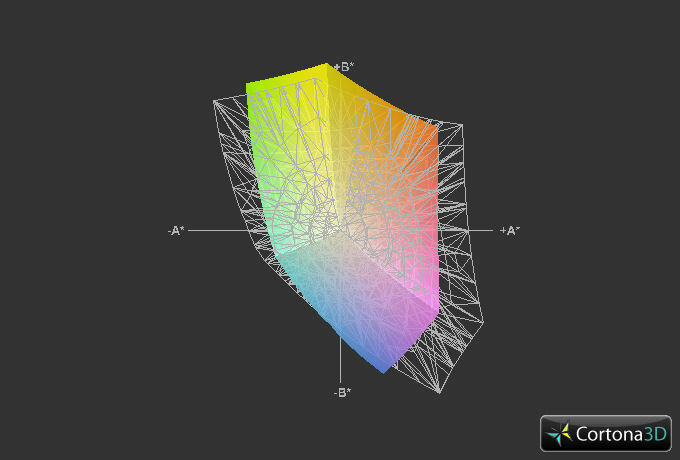 The programs sRGB and AdobeRGB cannot map the display, but this doesn't really matter for your average user, as these programs are only important in professional graphics work. 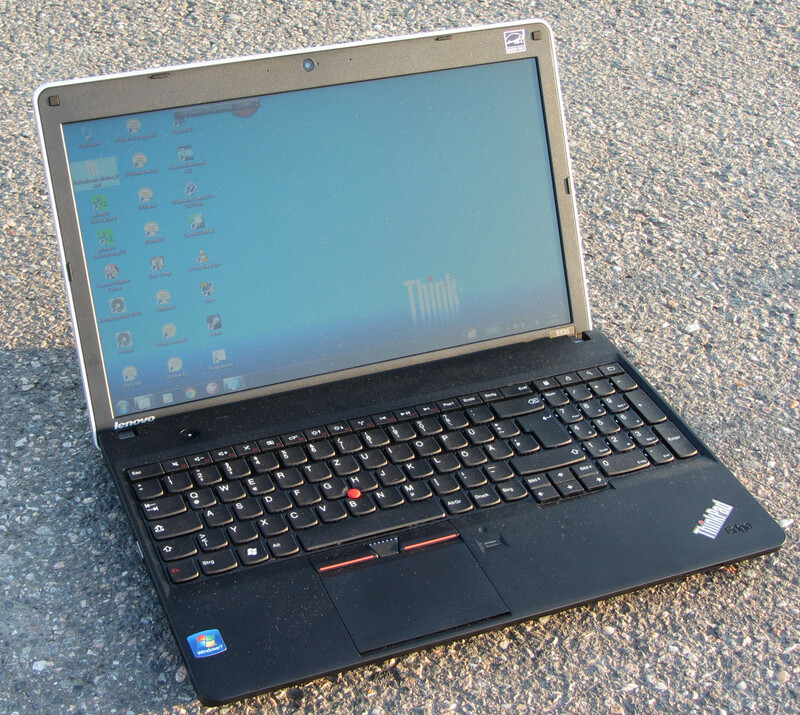 The Thinkpad Edge E535 outdoors. The brightness of the display is good enough for outdoor use. With the matte surface you are kept free from annoying reflection. The only thing that makes using the computer outside a problem is the poor contrast level. Direct sunlight should be avoided. By changing the vertical angle of the screen the picture is broken down quickly. By changing the horizontal angle the picture remains far more stable. Even if you turn the notebook a full 90 degrees you can still recognize what's on the screen. The display only darkens slightly. Lenovo advertises the Thinkpad Edge E535 as "a strong performing notebook for small and medium businesses". The components are therefore accordingly chosen. You are not going to get multimedia or a gaming notebook here. As mentioned before, there are different component variations of the Thinkpad Edge 525. The differences are in the installed APU, the memory size and the hard drive. Furthermore, there are variants that contain a dedicated GPU (AMD Radeon HD 7670M) next to the APU integrated GPU. These variants of the Thinkpad Edge 535 will also master the latest computer games. In terms of other multimedia features, the Intel-version Edge E530 is also worth a look, where, for example, you would get a middle class GT 630M GPU. Lenovo designed the Thinkpad Edge E535 with an APU (Accelerated Processing Unit; a combination of a CPU and a GPU) from the company AMD. This carries the name AMD A8-4500M. The CPU part of the APU is made of quad-core processor which works at a base speed of 1.9 GHz. The speed can be increased to 2.8 GHz (AMD Turbo Core). Unfortunately, we could never actually register a speed of 2.8 GHz. Despite this, the Thinkpad Edge 535 still made good use of the turbo function. During Idle mode and while doing office work all four cores were running at a permanent 2.3 GHz. It also looked the same during the Cinebench tests, with all four cores running at a permanent 2.3 GHz again. Occasionally the speed of individual cores would sink to around 1.8-1.9 GHz. The Cinebench tests are somewhat disappointing because they are on the level - or sometimes under – those of the AMD A6-3410MX-APU (e.g. in the Samsung Series 3 305V5A-S01DE) from the previous generation (Llano). If the full turbo speed was utilized, we could expect far better test results. It was only in the GPU intense GL tests that that the A8-4500M-APU was able to prove anything to us, similar when compared to the Thinkpad Edge 525. 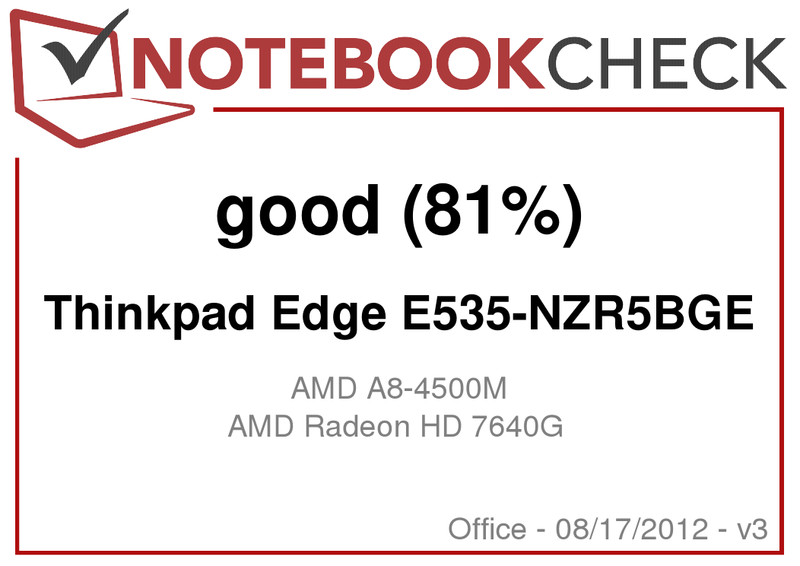 In the Single thread- and GL-tests the Thinkpad Edge 535 performed a lot better. The Multithread-tests showed more favor for the Thinkpad Edge 525. Going against the Thinkpad Edge E530 (i5-2450M/GT630M) the Thinkpad Edge 535 has no chance. The CPU and the GPU of the E530 are playing in a different performance ball park. The competition in the Intel camp lies in the current Pentium processors. The single thread test results of the A8-4500M are under those of the Intel Pentium B960. In the Multithread tests the AMD APU and the Pentium B960 are on par with each other. During our full stress tests (Prime95 and Furmark running parallel) while on mains power, the speed of the CPU fluctuated greatly. The speed leveled off around 1.4 GHz, with small up and down variations by individual cores (between 405 MHz and 2.3 GHz). 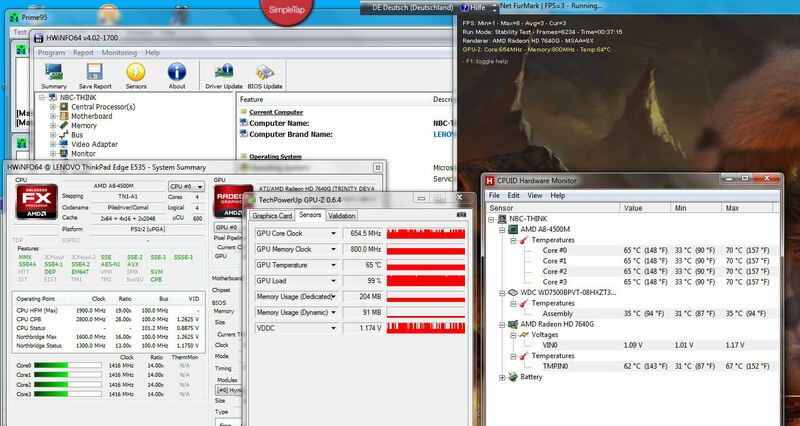 The speed of the GPU moved between 500 and 655 MHz. While on battery power all four cores ran with a constant speed of 1.9 GHz. On the other hand the GPU has been throttled at 335MHz. According to the Windows 7 performance index, the graphics chip is the weakest component of the system in reference to desktop performance. In everyday use the hard drive is found to be a negative aspect. Launching applications, install routes and finding files should all be running a lot smoother. The results from the PC Mark tests are on the same level as the APUs (AMD A6-3410MX, Samsung Series 3 305V5A-S01DE) from the last generation (Llano). Better results would have been possible. Also, at this point the lack of full turbo speed becomes noticeable, as during the PCMark tests the CPU never worked above a speed of 2.3 GHz. The Thinkpad Edge 525 could be beaten. In terms of system performance, the Thinkpad Edge 535 can't win against the Thinkpad Edge 530. The combination of a Core i5 processor, Nvidia GPU and a somewhat faster hard drive bring in far better results in the PCMark tests (+30% PCMark 7). Lenovo has included a hard drive from the Scorpio Blue series from Western Digital in the Thinkpad Edge E535. The hard drive boasts a capacity of 750 GB and runs at a speed of 5400 RPM. The average access speed of 66.2 MB/s is in the middle and the access time of 19.3 ms is a bit too high. The execution of program applications is a bit delayed. Lenovo provides hard drive protection with their own Active Protection System. A sensor perceives vibrations and, in the case of a drop (e.g. if the notebook falls off the table), puts the read/write head into the 'park position'. 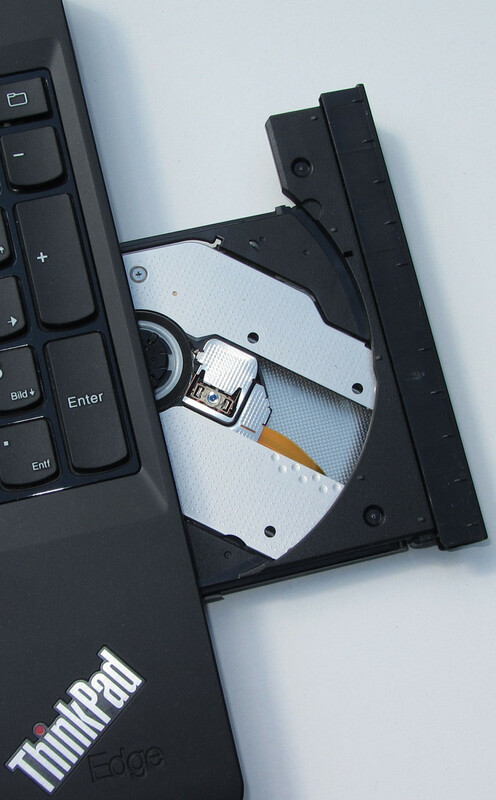 Therefore, damage to the hard drive and to the data that is on it can be minimized. The hard drive seems to be a bit oversized for a business notebook. This is where Lenovo should have been putting the focus on speed. A hard drive with a 7200 RPM speed is what should be expected, or even a small solid state drive as well. The GPU part of the AMD A8-4500M-APU is called the AMD Radeon HD7640G and is the graphics chip from the beginner class. It supports DirectX 11 and Shader Model 5.0. The chip operates at a regular speed between 500 and 655 MHz. The speed can also be reduced under this range, such as when the GPU runs at 200 MHz in idle mode. The results of the 3D Mark tests are on the level of beginner chips from other manufacturers – e.g. Intel HD Graphics 4000. The predecessor Thinkpad Edge E525 is beaten in every test. During our full stress, while using mains power, the GPU was running mostly at the full speed of 655 MHz. Every now and then the speed was temporarily reduced down to 500 MHz. When running on battery power the speed was permanently reduced to 335 MHZ. The decoder handles these tasks very well. We played a test video (Full HD resolution, H.264) and observed the CPU load. This turned out to be under 25%. With YouTube video playback of the same quality, the load was increased up to 40%. The notebooks from the Thinkpad series are primarily designed as work devices. The Gaming performance comes in second here and the test results are reflective of this. The games that we tested could only be played smoothly with low resolution and low detail settings. With a higher resolution and/or detail setting the games begin to lag. In comparison to the Thinkpad Edge 525, the frame rates of the games we tested had been greatly improved. Whoever wants to play computer games every now and then should probably take a closer look at the Thinkpad Edge E535 variant with a dedicated graphics chip. With the Thinkpad Edge E535, Lenovo is - as we have already seen with the Thinkpad Edge E525- providing a notebook that will work over the entire spectrum while staying quiet. In idle mode we measured a volume just under 32 dB, then under full stress that number rose to 33.5 dB. Only the DVD burner was able to achieve a higher volume with 35.8 dB. Since the optical drive is hardly ever used, the number is somewhat irrelevant. The Thinkpad Edge E535 in the stress test. During idle mode the temperature lies consistently in the green zone. The notebook generates a temperature between 29 and 36.5 °C on both the top and bottom sides. This temperature range allows for comfortable working and you can easily rest the device on your legs while using it. Under full stress the temperature rose moderately to between 33 and 40 °C, depending on the measuring point. At the measuring points above and below the dissipater we found readings over 40 °C. The temperature of the wrist rests was holding at a constant 30 °C while under full stress. Therefore, comfortable work is possible under all stress conditions. The operating speed of the CPU fluctuated a lot during our full stress test. The speed leveled off around 1.4 GHz - with big jumps both up and down. The temperature had leveled off at 65-67 °C after an hour of full stress. (-) The maximum temperature on the upper side is 46.3 °C / 115 F, compared to the average of 33.9 °C / 93 F, ranging from 21.2 to 62.5 °C for the class Office. (+) In idle usage, the average temperature for the upper side is 30.8 °C / 87 F, compared to the device average of 29.4 °C / 85 F.
Although the Thinkpad Edge 535 is designed for office and business use, the speakers do not sound bad at all. We have heard far worse speakers in the past. In comparison with Thinkpad Edge 525 there has been an improvement. Unlike with the Thinkpad Edge 525, there is no tinny sound. Overall, the sound is now far fuller and voluminous. However, you aren't going to get any bass from the Thinkpad Edge E535. The consumption of the Thinkpad Edge 525 in idle model can keep up with the E535. But under average stress the Thinkpad Edge 535 is going to use 8 Watts more that the Thinkpad Edge 525. Under full stress this is reduced to just a 2 Watt difference. Generally speaking, the performance increases of the Thinkpad Edge 535 create a subsequent energy use increase. 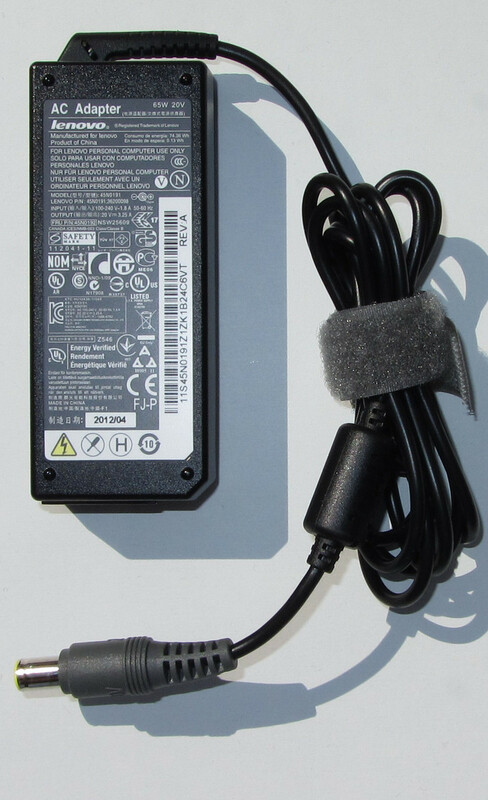 The included 65 Watt adapter never reaches its output limits. The comparison with the Thinkpad Edge E530 also looks good for the Thinkpad E535. In idle mode the energy consumption is level (E530 with Intel HD 3000 by Nvidia Optimus). Once the notebooks are running at full performance, the Thinkpad Edge 530 needs more power, and this is no surprise. 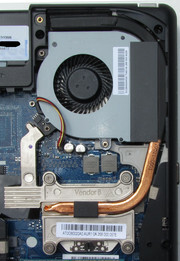 After all, there is a dedicated GPU (Nvidia GeForce GT 630M) inside the E530. Lenovo promises a battery life up to 8 hours for the Thinkpad Edge E535. Lenovo keeps this promise. In Idle mode the device lasted 8:26 h. The Thinkpad Edge E525 and the Thinkpad Edge E530 have respective battery lives of 6:24 h and 6:41 h. We test the idle mode with the Battery Eater Reader test. In the test the display uses minimal brightness, the energy saving profile is activated and the communications modules are disabled (WLAN, Bluetooth). Under stress the Thinkpad Edge E525 and the Thinkpad Edge E535 have an identical battery life of 1:31 h. The Thinkpad Edge 530 brings a time of just 1:05 h here. In the stress test the notebook passed the Battery Eater Classic test. In that test the display is set to a high brightness, high detail settings are used and communications modules are turned on. A single battery charge kept the WLAN test going for 4:48 h. The running time of the Thinkpad Edge 525 lies only 9 minutes under. The Thinkpad Edge 530 ended up with a run time of 4:03 h. With this test websites are contacted automatically by scripts at 40 second intervals. During the test the energy saving profile is activated and the display brightness is set at roughly 150 cd/m². The Thinkpad Edge 535 scores a battery life time of 3:46 h in the DVD test. This is enough to watch two feature films. The Thinkpad Edge 525 and the Thinkpad Edge 530 scored battery times of 3:34 h and 3:11 h respectively. For the DVD test the wireless modules are switched off and the display is set to the maximum brightness. It is the energy saving profile being used, or a higher profile (in the case the movie does not play smoothly). Overall, the Thinkpad Edge 535 has a better battery run time than both its predecessor and its brother. You can get even better run time from the device when you use a battery with a greater capacity. 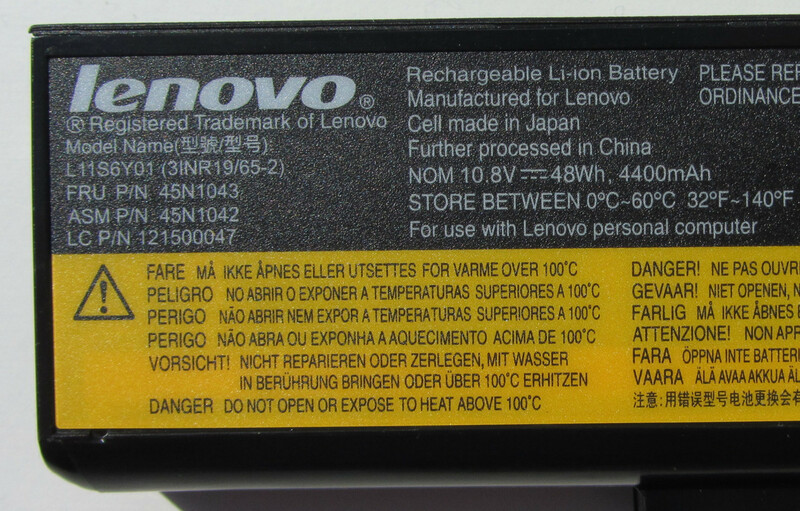 Lenovo offers a battery that fits that description (0A36311). The battery utilizes a capacity of 63 Wh. The run time with this battery should increase roughly 25%. This battery currently costs 80-100 Euros. 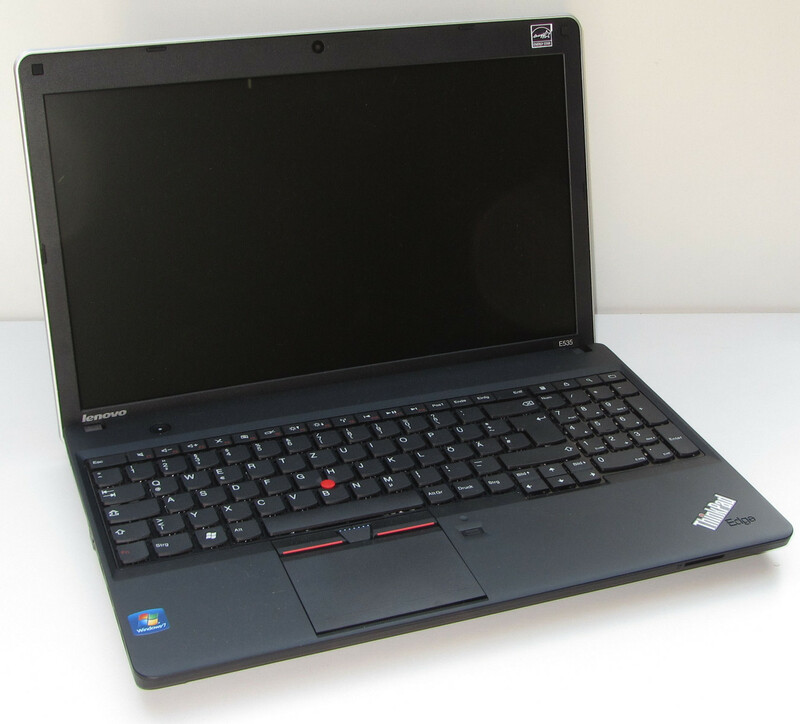 The Lenovo Thinkpad Edge E535-NZR5BGE. The Thinkpad Edge 535 has left us with a mixed impression - which relates it back to its predecessor, the Thinkpad Edge E525. Lenovo provides us with a work device in a robust case. The application performance is more than sufficient for office tasks. While doing the work the device is always quiet. The display uses a matte black surface and provides a quite high brightness level. In terms of maintenance the device shows us great results. The input devices are also good quality. Whoever finds that these qualities tick off everything that is important to them will be happy with the Thinkpad Edge 535. The device does however have negative qualities. Lenovo has built a very bright but poor contrast display. Should you choose to watch films or TV series regularly, you will find the screen doesn't make this fun at all. The build quality is not always as good as it could be (battery rattle). The Thinkpad brand name is associated with higher quality. The maximum CPU speed was not available. They have also installed a hard drive with lots of storage but only an average access speed. You really don’t need such a hard drive in a business notebook. This is when the hard drive speed should be the priority. A more carefully considered approach to choosing the hard drive and the display would have left this notebook in a far better position. For those who can't find the right device for them with the Thinkpad Edge 535 devices can also take a look back at the Thinkpad Edge 530, with an Intel CPU and (without dedicated graphics) a similar price tag. Alternatively, many notebook manufacturers offer competition from similar devices, which are on the same price level as the Thinkpad Edge 535 (Samsung 300E5A, Dell Vostro 3555). The battery weighs 296 grams. ...and has a maximum output of 65 Watts. Great: The cooling system is easy to clean. Remove two screws and you can take out the hard drive. Two slots for RAM are available. The Thinkpad Edge 535 is great for maintenance and for upgrade options. 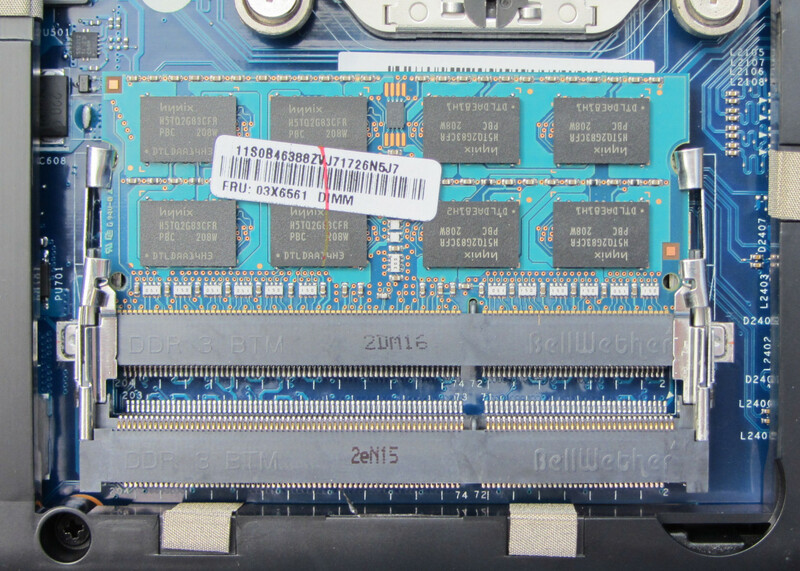 The small panel covers the BIOS battery and the WLAN module. The webcam is surrounded by two microphones. Accessing the system can be protected by a fingerprint lock. The keys have a good feel while typing. It is possible to simply take out the screw and swap the drive. Small processing problems are noticable. The good input devices and the three USB 3.0 ports. A display with far better contrast. That Lenovo did not let the CPU part of the APU run at full turbo speed. 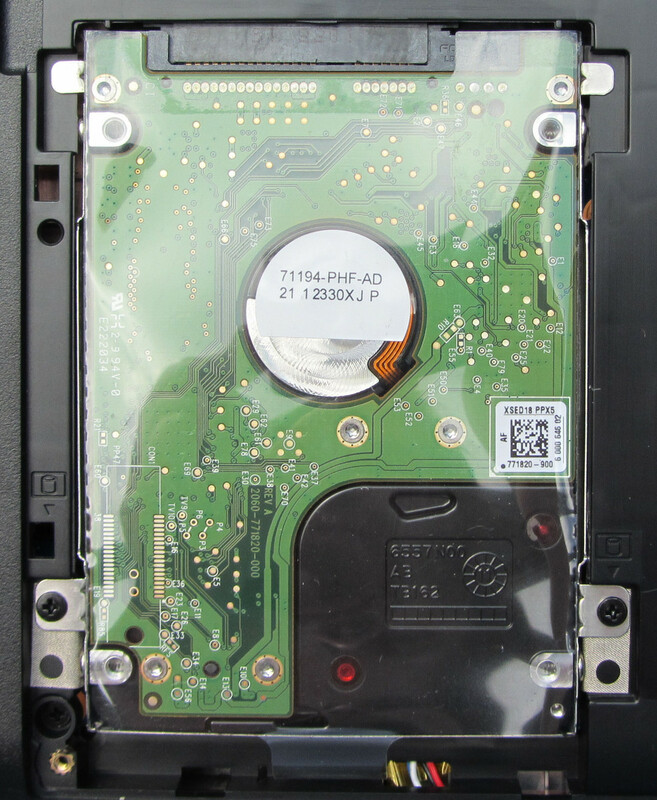 Competition for this device includes its own predecessor (Thinkpad Edge E525) and - to a limited extent - its brother with Intel on the inside (Thinkpad Edge E530). Other office device manufacturers: Topliste Office.